Since my friend Dallas Willard died, I’ve found myself doing things that are “out of the box.” As a self-employed person I’ve tried to stay focused on writing, teaching and spiritual direction. No distractions! But as part of DW’s advisory council, I watched him do tangential things because (I thought) he wasn’t staying focused! Why? Because he loved God (and listened to God) and loved people (and listened to them). One evening we studied Jesus’ healing of the bent-over woman, who had a “spirit of weakness” (Luke 13:10-17). Coming from Dr. Luke, this probably meant nobody could explain why she walked bent over double. Perhaps her griefs and burdens (possibly resentment and guilt) weighed her down. Maybe she had been physically or verbally abused until her twisted-up emotions translated themselves into her body. For 18 years, she had moved through life looking at the ground. So I had my friends and I walk around bent-over for 5 minutes. From this position, we talked about what her life was like: talking to faces she could not see; twisting around to try to see faces. We noted how her head must have hurt and how dust must have gotten in her eyes. We found it was hard to move our mouths to converse while looking at our feet. (My friends know about this. Because people on the street avoid looking them in the eye, they tend to stare at their shoes, if they have them.) After a few minutes, we all just wanted to lie down and feel sad. Then we talked about how the woman may have felt when Jesus called her forward to be healed. Why hadn’t she already approached this renown healer as others did? Did she think, Jesus wouldn’t want to help me? Or, My problem is not life-threatening, or Maybe God wants me bent over – that’ll teach me some lesson! When Jesus says to her, “Woman, you are set free from your ailment,” she doesn’t stand up immediately. Only when he also lays hands on her does she stand up and praise God. I encouraged my friends to hold that moment. What was it like for her to stand upright and gaze at Jesus’ face? Were her eyes wide open? Did she stop breathing? Did she cry? The passage moves quickly on to the synagogue leader scolding the congregation (really Jesus) for a healing having occurred on the Sabbath (which he assumed would be a day God wouldn’t help people even though the law said not to withhold help, Dt. 22:3). Jesus challenges them to consider that they pull their donkeys (their “cars”) out of the ditch on the Sabbath. Why should the donkeys be helped but not her? Finally my friends closed their eyes as I read the passage aloud and asked God to put them into the passage. When they shared where they found themselves, one woman who was going through a lot talked about how she found herself as the bent-over woman gazing at Jesus’ face–so much that she didn’t hear the complaint made by the synagogue leader. “Throughout the commotion, I saw only Jesus’ face,” she said. As she said this, tears came to my eyes. I’ve been in the middle of much commotion. I’ve been distracted by it all, wishing people behaved differently. What is wrong with them? Why don’t they have compassion?! But my friend showed me the way: just keep gazing on Jesus’ face – that love, that grace-filled truth-telling, that willingness to appeal to people’s better sides. Don’t sweat the rest. Is there a moment in the bent-over woman’s experience you identify with (frustration from burdens, not wanting to bother Jesus, gazing at Jesus’ face)? Do you perhaps identify with the synagogue ruler – why can’t people just follow directions? Is there a space in your life where you need to gaze at the person of Jesus and block out the commotion? 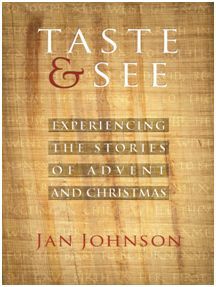 If you’d like to do this type of Scripture study and participative meditation, you might enjoy this newly-released advent guide: Taste & See: Experiencing the Stories of Advent and Christmas You can use it on your own, with your family or in groups. It includes some historical research that shows the nativity events in a different light as well as many cultural cues that help you enter the story and experience what it might have been liked to have been there.